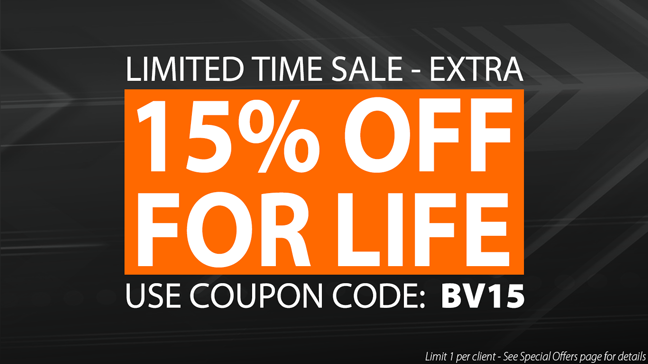 LIMITED TIME OFFER: Get an additional 15% off FOR LIFE with coupon code BV15 - See offer details and restrictions below. Coupons and special offers are limited to 1 per client, new orders only, and may not be combined with other coupons, free trials, or special offers. Coupons and special offers may not be used to transfer, upgrade, or renew from any existing TurnKey Internet service plan. To our loyal current clients: We do not like it when companies treat new customers with discount offers better than their loyal existing customers too! We have great news for you, purchase any new special offer deal today and we will add on '1' free month of service to the new product for every year you have been a customer! Please be aware, you can not cancel or transfer from an existing TurnKey service at these special offer discount rates - but you can order a new service on these discount promotions and enjoy extra free months of service as a bonus for your continued loyalty! Free months are added after your 12th month of paid service on the new plan you subscribed to during this special offer promotional deal. You may only sign up for '1' new product or service at the discount rate, and you may not cancel or transfer an existing TurnKey service while maintaining the special offer discount promotional pricing. Account must be in good standing to qualify and maintain discounts and promotional offers.